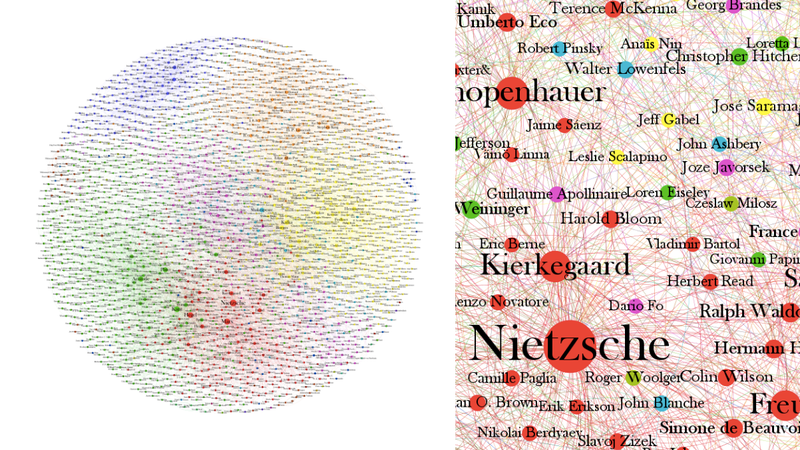 Visualizing how the world's ideas fit together is no mean feat. But now you don't have to struggle, because Brendan Griffen has mined Wikipedia to create a map of how the world's greatest thinkers influenced each other. It really is fascinating (to me at least) to start at one node and bounce along the connections to a distantly related someone else. People in philosophy influencing fantasy writers who influence comedians. It shows one thing above all: the evolution of ideas is a non-linear process. We too, are somewhere in this web, albeit at a smaller scale. We too, are the sum of many.